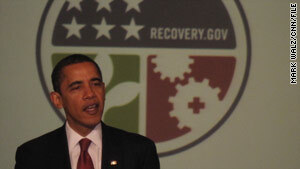 President Obama's economic stimulus plan has lost support, polls indicate. (CNN) -- Though the federal stimulus plan is unpopular, many Americans overwhelmingly support the basic provisions within the bill, a new national poll suggests. Offered a range of options, about eight in ten people polled in a CNN/Opinion Research Corp. survey favored government spending on roads and bridges. A similar number favored using stimulus money to aid unemployed workers. Seventy percent in the survey, released Friday, approved of spending some of the stimulus money on tax cuts, and sixty percent favored using the money to increase spending on mass transit projects. While these options have support, another CNN/Opinion Research Corp. survey suggests respondents are displeased with who they believe the stimulus plan helped. Fifty-four percent of Americans polled think the plan has helped bankers and investors, and only one-quarter think the stimulus plan has helped the middle class, according to the survey, released Wednesday. According to another CNN poll released Sunday, 56 percent of the public opposes the stimulus, with 42 percent supportive of the plan. Last March, just weeks after President Obama signed the stimulus bill into law, a CNN survey indicated that 54 percent supported the program, with 44 percent opposed. The poll released Friday was conducted January 8-10, with 1,021 adult Americans questioned by telephone. The survey's sampling error is plus or minus 3 percentage points.